This antibody was purified by gel filtration. Our Abpromise guarantee covers the use of ab27316 in the following tested applications. Flow Cyt: Use 10 µl to label 106 cells or 100 µl of whole blood. Transfers sialic acid from the donor of substrate CMP-sialic acid to galactose containing acceptor substrates. Belongs to the glycosyltransferase 29 family. The HB-6, CDW75, and CD76 differentiation antigens are cell-surface carbohydrate determinants generated by this enzyme. Golgi apparatus > Golgi stack membrane. Secreted. Membrane-bound form in trans cisternae of Golgi. Secreted into the body fluid. CD75 was immunoprecipitated using 0.5mg HepG2 whole cell extract, 5µg of Mouse monoclonal to CD75 and 50µl of protein G magnetic beads (+). No antibody was added to the control (-). The antibody was incubated under agitation with Protein G beads for 10min, HepG2 whole cell extract lysate diluted in RIPA buffer was added to each sample and incubated for a further 10min under agitation. Proteins were eluted by addition of 40µl SDS loading buffer and incubated for 10min at 70°C; 10µl of each sample was separated on a SDS PAGE gel, transferred to a nitrocellulose membrane, blocked with 5% BSA and probed with ab27316. Ab27316, at a dilution of 10µl for 106 cells or 100 µl of whole blood, staining CD75 by Flow Cytometry. ab27316 has not yet been referenced specifically in any publications. Publishing research using ab27316? Please let us know so that we can cite the reference in this datasheet. 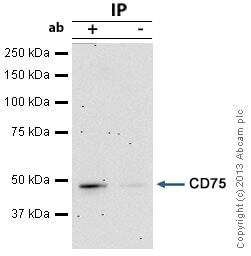 Dear technical support: This customer has highly interested in ab99597 (Rat monoclonal [1B4B1] Secondary Antibody to Mouse IgM - mu chain (Allophycocyanin)), he wants to know is weather this antibody can recognize to ab27316 (Anti-CD75 antibody [B-L5]) or any IgG primary antibody or not? Furthermore, he also raises an inquiry about ab53318 (Anti-CD105 antibody [MEM-229] (FITC)), ab81289 (Anti-CD34 antibody [EP373Y]) and ab19622 (Anti-CD44 antibody [IM7] (FITC)), he wants to ask for your help to offer any suitable selection about the isotype control of these antibodies. Would you please help this customer to solve these problems? Thanks for your kindly help. Thank you for contacting us. ab99597 is an allophycocyanin conjugated secondary antibody specific to primary Mouse IgM, it would therefore recognise ab27316 (a Mouse IgM). It would not recognise IgG. For more details about secondary antibodies please visit www.abcam.com/secondary and https://www.abcam.com/index.html?pageconfig=productmap&cl=918. About isotype controls, we have a guide that can be found at https://www.abcam.com/index.html?pageconfig=technicalfaqs#5 For ab53318 (mouse monoclonal IgG2a - FITC) we have ab81197 For ab81289 (rabbit monoclonal IgG) we have ab119749 For ab19622 (rat monoclonal IgG2b - FITC) we have ab37364 I hope this information is helpful to you. Please do not hesitate to contact us if you need any more advice or information.